OTL Blog » Blog Archive » Montreal’s amazing arts export: the Infringement Festival circuit covers three cities in 2014! Montreal’s amazing arts export: the Infringement Festival circuit covers three cities in 2014! Montreal’s infringement festival is one of the city’s most amazing cultural exports and has inspired a whole new way of doing the arts in cities and countries far beyond Montreal’s island shores. In 2014, the Infringement Festival is celebrating its 10th anniversary with 3 festivals in 2 countries, and a plan to provoke critical discussions at the World Fringe Congress in Edinburgh, Scotland! The infringement festivals offer the dream of touring a performance, which is more out of reach than ever for most artists. 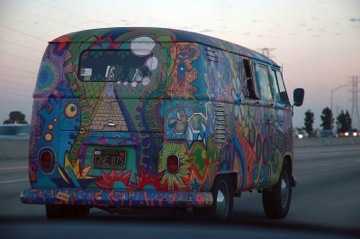 Because the cost of touring is often seen as prohibitive, many artists (and their works and performances) stay put in their home communities. Not only are there expensive travel and accommodation costs associated with touring, but booking venues, advertising, potentially hiring others to do box office and tech, and so forth can all add up to a costly bill in a foreign city. It’s a shame, because with touring comes amazing benefits such as increased exposure, network-building, a fun experience in a different city, and being exposed to the works of other like-minded artists. It is also ideally an expression of solidarity with artists in the community being visited, participation in a common dream and another voice to the artistic and social discourse. Unfortunately, artists choosing to play in established places like the Fringe Festivals are also required to pay hundreds of dollars in additional “registration fees”. In Canada, there are actually costs to be associated with the now-trademarked word “Fringe”. 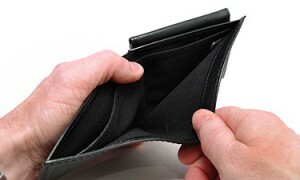 At the original Edinburgh Fringe in Scotland it has gotten so bad that the “registration fee” of 400 pounds ($620), more than a month’s rent for many artists, makes playing there increasingly impossible. According to Fringe veteran Tommy Sheppard, who now runs comedy venues at the Edinburgh Fringe, “The ‘pay-to-play’ system means that the rich kids always win. No matter how funny a working-class kid is, if they can’t ask mum and dad to give them five grand they are not going to be able to come up here to perform.” Once a vibrant stage for cutting social criticism and artistic inclusion, the Edinburgh Fringe now resembles an elite playground for wealthy theatre hobbyists. As arts administrators constantly find more ways to milk artists with registration fees, box office cuts, and by associating them with corporate sponsors, it can cause the average artist to throw their arms up in frustration. With all the corporate takeover and co-opting of the culture, it’s easy to give up on any dreams of touring and throw in the towel. Sadly, with the corporate takeover of culture, there’s often a risk of bankruptcy to simply do and promote the arts. Enter the infringement festivals. Developed after artists were kicked out of the Saint Ambroise Montreal Fringe in 2001 – for offending a corporate sponsor – the infringement model does away with all of the corporate interference polluting the other festivals. The infringement promises to put artists first, and to ensure the community festival is not tainted by corporate greed or overzealous arts administrators. The Brooklyn infringement Festival is the first on the international circuit and it runs from April 10 – 13. It’s a hot weekend festival in Brooklyn, New York. Centered at Don Pedro, this festival is especially welcoming of musicians and bands to play in its sets. Artists can apply here (Deadline: March 1st). Next up, the Montreal infringement Festival is celebrating its 10th anniversary by stepping up to try and protect local culture at-risk. This year organizers are asking infringers to “make some noise” to protest ongoing attacks against small venues in the form of ambiguous “noise complaints” that come with fines ranging from $1000 – $12,000. Infringers are being urged to contact the Mayor of the Plateau (Luc Ferrandez) and the Mayor of Montreal (Denis Corderre) to demand that the harassment against artists and cultural destruction permanently stop. The Montreal infringement festival runs from June 19 – 22 and artists can apply here. (Deadline: June 1st for printed program, otherwise can apply at any time for website inclusion). 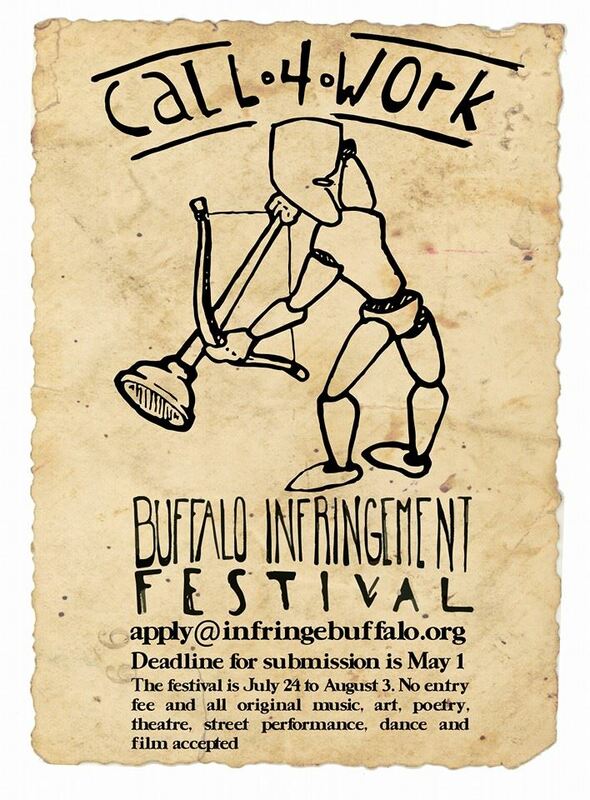 Third up is the expansive Buffalo infringement Festival, one of the largest cultural events in Western New York. Celebrating its 10th edition, expect “10 days of arts under the radar” from July 24 – August 3. 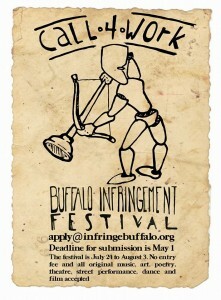 Buffalo is the largest and most comprehensive of all infringement festivals. Truly an incredible cultural experience, the streets of Buffalo come alive with pure, unadulterated arts during the infringement fest. In the tradition of the original 1947 Edinburgh Fringe, it’s run by a strong community of artists and rejects corporate models that compromise and taint the integrity of the festival. Artists can apply online here (Deadline: May 1st). Finally, the World Fringe Congress returns to Edinburgh, Scotland in 2014 after a one year hiatus. The second edition of the Congress may prove to be interesting as infringement artists challenge the thinking of often-corporate “Fringe” festival leaders from around the globe to ensure that Fringe artists are treated fairly and are not exploited in any way. In 2012, the first-ever World Fringe Congress invited the infringement festival to Edinburgh for its perspective on what is currently wrong with the global Fringe movement. 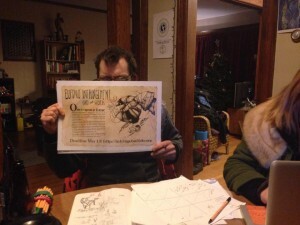 Following the Congress, Donovan King released his Critical Report from the World Fringe Congress, which was also adapted into a performance for the 2013 Buffalo and 2014 Brooklyn infringement festivals. At the 2014 World Fringe Congress, representatives of the infringement festival promise to continue challenging all activities that compromise the Fringe, such as pay-to-play fees, unethical corporate sponsors and banning political artists. Each infringement festival is welcome to send delegates to the 2014 World Fringe Congress. To conclude, there are a lot of opportunities for artists to travel the circuit and get to know the global infringement community this summer! 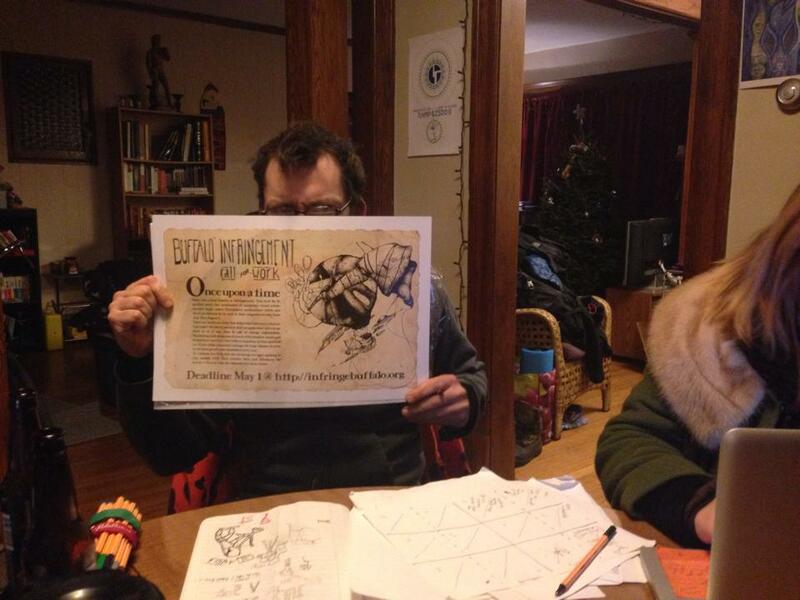 Join your fellow infringers at festivals in Brooklyn, Montreal, Buffalo, Edinburgh and beyond! You can also start your own infringement festival! Empower your community by reclaiming culture and rejecting corporate interference in the arts. Join the global infringement movement! This entry was posted on Monday, February 17th, 2014 at 6:50 am	and is filed under Activism, Community issues, General, Performance, Road Trips, Uncategorized. You can follow any responses to this entry through the RSS 2.0 feed. You can leave a response, or trackback from your own site.